Conductive hearing loss due to something interfering with the sound passing to the inner ear. Weber test — a tuning fork sounded and placed on your forehead or teeth. This can help distinguish conductive from sensorineural hearing loss. Rinne test — a tuning fork sounded and placed in front and then behind of the ear. This can help distinguish conductive from sensorineural hearing loss. Audiometric tests — These involve listening to tones in a soundproof room and reporting whether or not you hear the tones. Tympanometry — This test measures the pressure in the middle ear and examines the middle ear’s response to pressure waves. Computed tomography (CT) or magnetic resonance imaging (MRI) scan of the head — a type of imaging study that uses a computer to make pictures of the inside of the head. This may be done to check for a tumor or bone injury. Electrocochleography — This tests the cochlea and the auditory nerve. This is probably the simplest, easiest treatment for hearing loss. There are many types. Digital technology has created tiny devices that cause little distortion. One example of a device is the FM trainer. With this device, a person speaks into a microphone. The sound is then transmitted by radio waves directly to the earphone set worn on your ear. This can be particularly helpful if you have trouble hearing speech when there is background noise. FM trainers can also help children with hearing loss to understand their teachers. The cochlear implant is surgically implanted. It directly stimulates part of the brain and uses a tiny computer microprocessor to sort out incoming sound. When hearing loss is caused by other medical conditions, it may be possible to improve hearing by treating those conditions. If your hearing loss may be caused or worsened by a medication, talk to your doctor about stopping that particular drug or changing to a drug that does not affect hearing. It may be possible to slow age-related hearing loss in elderly persons through dietary modification. For example, if you are deficient in folic acid, this supplement may be helpful for you. Talk to your doctor. 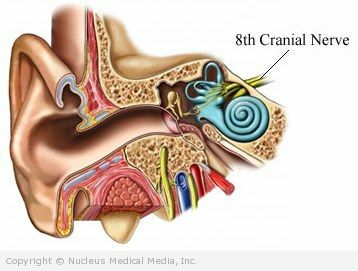 Surgery may be done in some cases of conductive hearing loss to correct the middle ear problem, such as in otosclerosis, ossicular damage or fixation, and ear infections. Turn off background noise (eg, TV, radio).